Host international conference calls automatically without the need for your participants to dial-in or enter a passcode. If you often have international conference calls with the same group, this free tool makes international conference calling easy to get everyone on the conference call at virtually the same time. For example, with UBlast you can host international conference calls with your group of associates by simply speed dialing the toll free access number. The conferencing bridge will automatically dial-out to all of the participants you've entered on your dial-out list. From you PC or Mac, login and create or edit your dial-out list online. Customers with smartphones or any HTML mobile phone i.e., BlackBerry® or iPhone®, etc. can make on-the-fly edits to their call list by navigating to the web interface. #1 To use the UBlast feature, simply dial the 800 access number and login with your leader Passcode. #2 Then enter [ * 9 2 ] on your phone keypad. Our conferencing bridge will then automatically dial-out to the list of phone numbers that you've set up in you dial-out list. No one needs to dial-in if they are on your UBlast list. Note: Your account must have the dial-out UBlast feature enabled to use UBlast. UBlast is a free optional feature of the International Conference Call Legacy Plan. This feature enables you to collaborate at your command. If your international conference call is critical, an emergency, or you must have all parties on a call immediately, UBlast is your solution. If you frequently host conference calls with the same group of participants, UBlast makes it easy to initiate international conference calls on-the-fly. One of the most common complaints we've heard from conference call users is that some participants seem to forget to dial in or when they do, they may be late. This feature helps to mitigate those issues timing issues with international conference calling. Unlike the traditional Meet-Me conference calls where all participants dial-in and enter their participant PIN at a scheduled time, the UBlast conference call is initiated by the moderator. So, instead of everyone dialing 'in', this feature automatically dials 'out' and simultaneously connects your entire international conference call, -now. You can use UBlast anytime it benefits you to do so. For example, use it for weekly international conference call meetings, to collaborate with teams, groups and committee members, to provide project reports or use it for board meeting conference calls. UBlast eliminates the need for conferees to remember to dial-in and empowers the moderator to control and manage day-to-day conference calls on the moderators schedule. Use any landline, cell phone or VoIP line. See screen capture below of UBlast Web interface. You will receive a special Web link to set up your dial-out list when the UBlast feature is requested. After you create your list online, use any phone to initiate conference calls via your UBlast list. Once your account is activated and the free UBlast feature is enabled, you'll be able to set up your list of participants for auto dial out when you enter the [ * 9 2 ] keypad command on your phone. The UBlast feature works 'internationally' so you can include domestic and international phone numbers on your dial-out list. You can have up to 50 phone numbers on the UBlast list. This is an example of the UBlast Web interface used to set up and edit your dial-out list. What does the participant hear when they are called by the conference bridge ? The moderator can use any phone -mobile, landline or VoIP phone to initiate a UBlast call. 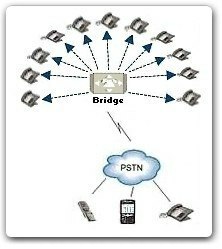 Many of our customers use their BlackBerry® or iPhone® and store the toll free bridge number in speed dial on their phone. So, a group call is only one call away. Also, moderators create a speed dial entry that permits dialing the entire string of required digits to automatically reach their UBlast list. Create it once for easy use. You may need to reference your phone device user manual for exact syntax unique to your phone device. UBlast automatically dials out to U.S. and international participant destination phone numbers. Check your phone device user guide for exact speed dial entry instructions. At any time, the moderator can dial [ * 0 ] star-zero and the operator will come on the line immediately to assist 24/7. In addition, U.S. based Customer Service is available 24 hours a day, 365 days a year via a Toll Free or direct toll number sent upon account activation. Credit card billing is required for the UBlast feature. UBlast can 'automatically' get your group or team on an international conference call in seconds. Simply dial the bridge and enter [ * 9 2 ] on your phone keypad. 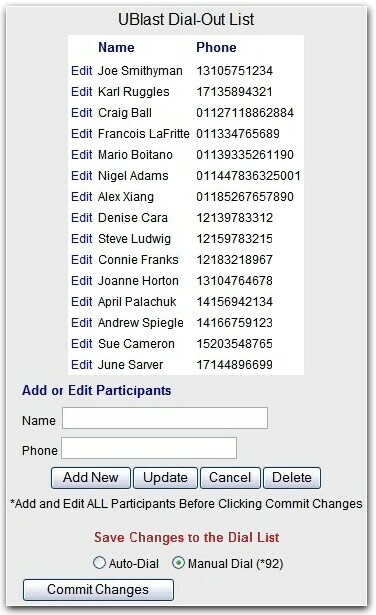 Your participant's phone will ring and they will be in your call without needing to call an access number. UBlast reverses the process of a traditional conference call and puts the control of the conference call in the hands of the moderator. Think of UBlast as your conference call valet automatically dialing out to your domestic or international conference call participants. No need to wait for anyone to dial-in. UBlast is your solution for gaining time management control with your international conference call group or team calls.